I’m on a cleaning spree this month; time to get the clutter and the supplies and organise it all into one place. Maybe it’s because I had a particularly stressful week, maybe I just needed a spring clean. Last week it was my vanity, this week it’s my crochet and craft stash. I have an old wardrobe that I’m eventually going to repaint to match the second bedroom, but in the meantime there’s no reason we shouldn’t put it to good use! This article may contain affiliate links which if you decide to purchase through them may provide me with a small commision towards my yarn/ craft stash. You’ll be pleased to know I only recommend products that I have personally used and loved. Please read my disclosure policy. My supplies -much like my blog- can be effectively split into 2 categories; crochet and crafts. So I tried to split the wardrobe up this way; crochet below and crafts above. Of course there is some overlap according to what fits where, but it generally worked. This is the before picture of the wardrobe, all set up and ready to go. It needed a dust, it had been a while since it had some use. And one of the hinges has come off but the door still works fine. So all in all not too bad going. Eventually the plan is to put an extra shelf in the bottom; once it’s a craft cupboard I’ll need less hanging space and more shelf space. I love the little tie rack on the left and would love to utilise it for ribbons or tapes. 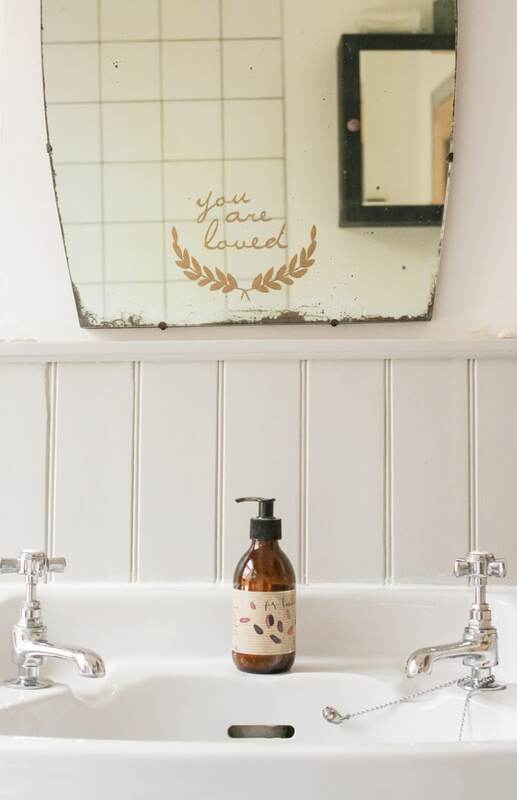 Once the mirror is cleaned up I’d like to put a pretty stencil on it, maybe something cute like this. Hopefully once painted up it should match the dressing table a little more and fit into the room better. ‘The stash’ was hidden in various corners all around our house and was quite frankly getting on my nerves. I want my windowsills to be full of picture frames and pretty trinkets, not 5kgs of PVA. Quite frankly it was ridiculous. This windowsill was a mess and a hazard: every now and then things would just start to slide if I tried to move anything. The yarn stash was in fact wedges down the side of my couch. Great place to keep it for easy access…. not so good for not looking like a crazy yarn lady. I had bought myself a lovely little basket from amazon ( the one in the cover photo, here if you want to get one yourself) to store yarn in and it had slowly started to overflow. It turned into an overflowing basket, with another basket and a collection of carrier bags. It was quite unbearable. The other side of the couch hadn’t fared much better: my caron cakes box and a bag of knitting supplies from my mum had wedged themselves down there and set up shop. The cupboard in the box room upstairs was definitely the worst offender. Along with lots of other things that no longer had a home, this was where my ‘scrapbooking’ supplies lived. You can hardly call them scrapbooking supplies… more like a collection of ribbons, stamps and tissue paper overflowing from a collection of boxes and bags. Sharpies drowning under escaped staples. Tissue paper crumpled under blocking mats. Inkpads and stamps tossed together and forgotten about. Pure unforgivable mess. Of course no organisation attempt would be complete without some of my hoarded sturdy boxes. My beauty box came in handy once again and a sturdy box I got a biscuit hamper in once also made the cut. I needed to utilise the bar in the wardrobe so I kept by some clothes hangers to hang some bags on for now. In the future I may use it to hang over scraps of material but we’ll see how that goes. That little rainbow bag is keeping a very special yarn safe! When we were in the lakes last year I attended Woolfest and bought my first knitting patterns and this beautiful shimmery yarn from Chester Wool Co. It is so wonderfully soft and pretty that I love simply squishing it! I am going to knit this shawl, I just need a bit more confidence in my knitting first. I don’t want to risk ruining my pretty pretty yarn. My knitting supplies managed to condense down into one of the small baskets; just about fitting in the collection of yarn needles I was given by my mum, along with her many knitting patterns and handmade bags for them all. My ‘random’ crochet supplies also went into a basket of their own. Along with many crochet hooks (who really needs 3 sets of hooks?) this also included balls of crochet thread, pompom makers and my collection of buttons. Btw I keep my buttons organised in this set, I highly recommend them if you have a large collection of buttons or other small items. The smallest of these is brilliant for storing my most used items such as stitch markers and fits lovely in a project bag. My fibrefill stuffing was the only thing that didn’t really find a place so I popped it into a gap at the end. I put the bag facing out so it’ll be super easy to grab a little wad of it when I need it. Craft supplies are really hard to organise; everything crosses over and links together so there are no real defined categories. First thing I did was take all my drawing and colouring supplies -coloured pencils, sketch books etc.- and lined them up on the top shelf. It’s been a long time since I did any drawing so having them out like this may encourage me to use them more. I then sorted all my stamps and inks. I have an old travel toiletries bag with a hanger on that came in super useful here. It was just big enough to store all my stamps in with a little space leftover. After some thought I decided my stamps and sharpies are often used together so in went the sharpies too. You can never have to many sharpies! While sorting my supplies into categories I realised just how much pretty paper I have: books and scraps and sheets all over the place! I put all these into a basket of their own, along with the hardware I would used with them: cutters, pretty scissors, staplers etc. My unicorn bag (seriously? how cute is this?!) became the home of my packaging supplies: tissue paper, cellophane bags, pretty ribbons. And another zippy bag holds my curtain rings…. because I’m convinced I’ll have a crafty use for them one day. Glues and sprays and things are hidden away in my biscuit box for now. And my beauty box is now home to all the keepsakes and receipts that I keep telling myself are going into a scrapbook. It looks like a lot less once it’s tidied away! I stood back and looked at my work. And I feel cleansed! The top of my stairs no long has a wardrobe on it (for the first time in 6 months) so the landing feels bright and airy now! My project basket is now just for the project I am doing and looks so pretty sat next to the couch! Speaking of which I don’t have a pile of cr*p next to the couch! Space sweet space! Now that all my supplies are in the wardrobe and tidy they look so small! I definitely need more! How do you organise your stash? I love to see other people’s organising solutions -not to mention drooling over their stash!- so comment below and show me your supplies! Sign up to my newsletter to see more posts like this! Honoured to Receive a Blogger Recognition Award! Thank you for joining The Really Crafty Link Party this week! Thank you! A guest room wardrobe is a great place for some sneaky craft space!! It is so easy for it to get out of control! I found it quite therapeutic, I’d love to do yours too!! Glad you enjoyed reading! There are far too many pretty craft supplies and you never know what you’ll need next! I can never resist! GOod luck with your decluttering efforts! Tutorial: Recycle Leftover Candles into Wax Melts!